ClamAV is a standard anti-virus and will probably be the most familiar to you. There is actually a Windows version of ClamAV too. 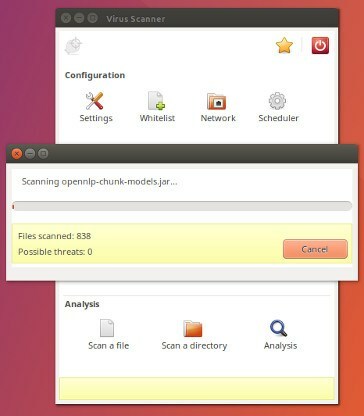 ClamAV and its graphical front end are packaged separately. That’s because ClamAV can be run from the command line without the GUI, if you choose. Even still, the graphical interface ClamTK is easier for most people. The following is how to install it. You can also find clamav and clamtk in your distro’s package manager if you are not using Ubuntu based distro. After both programs are installed, you have to update its virus database. Unlike everything else with ClamAV, that has to be done as root or with sudo. There’s a chance that freshclam is being run as a daemon. To run it manually, stop the daemon with Systemd. Then, you can run it normally. It’ll take some time, so just let ClamAV take care of things. Go back to the main menu and click “Scan A Directory.” Select the directory that you want to check. 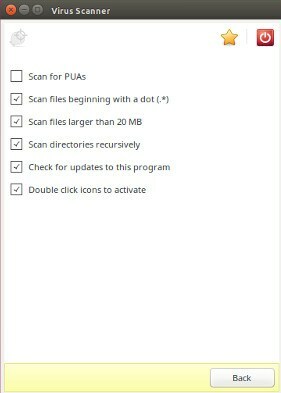 If you want to scan the whole computer, select “Filesystem.” You may need to rerun ClamTK from the command line with sudoin order for that to work. 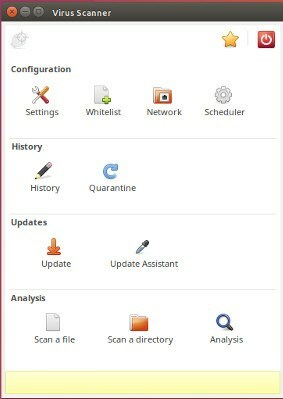 After the scan completes, ClamTK will present you with any discovered threats and allow you to choose what to do with them. Deleting them is obviously best, but may destabilize the system. This comes down to a judgement call for you. The next scan to install is Chkrootkit. It scans for a type of malware specific to Unix-like systems like Linux and Mac – the rootkit. As the name suggests, the aim of rootkits is to gain root access on the target system. 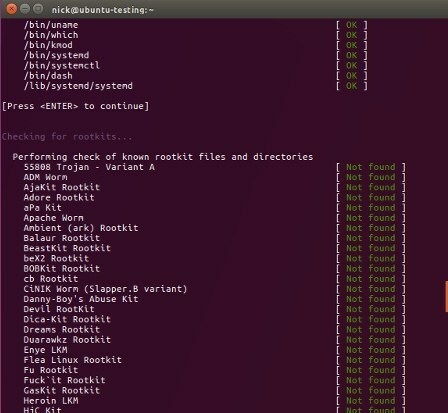 Chkrootkit scans system files for signs of malicious alterations and checks them against a database of known rootkits. Chkrootkit is available in most distribution repositories. Install it with your package manager. This one is very easy to run. Just run the command as root or with sudo. It’ll run down a list of potential rootkits very quickly. It might pause for a while on some while it scans through files. You should see “nothing found” or “not infected” next to each one. The program doesn’t give a final report when it finishes, so go back through and manually check that no results turned up. You can also pipe the program into grep and look for INFECTED, but that won’t catch everything. 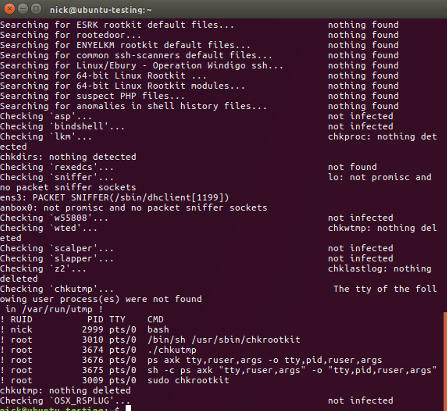 There’s a strange bug with Chkrootkit that reports a false positive for Linux/Ebury – Operation Windigo. This is a long-known bug caused by the introduction of a -G flag into SSH. There are a couple of manual tests you can run to verify that it is a false positive. First, run the following as root. It should turn up nothing. Next, check that the malware isn’t using a Unix socket. netstat -nap | grep "@/proc/udevd"
If neither command turns up any results, the system is clean. There also appears to be a fairly new false positive for tcpd on Ubuntu. If it does return a positive result on your system, investigate further, but be aware that the result could be incorrect. You also may encounter entries for wted. Those can be caused by corruption or logging errors on system crashes. Use last to check to see if the times line up with reboots or crashes. In those cases the results were probably caused by those events and not malicious activity. Rkhunter is yet another tool for searching out rookits. It’s good to run both Chkrootkit on your system to ensure that nothing slipped through the cracks and to verify false positives. Again, this one should be in your distribution’s repositories. The program will stop after every section. You will probably see some warnings. Many arise because of sub-optimal configurations. When the scan finishes, it’ll tell you to take a look at its full activity log at /var/log/rkhunter.log. You can see the reason for every warning there. It also gives you a complete summary of its scan results.